​James Backhouse is a highly-skilled craftsman upholsterer with 36 years’ experience who takes pride in his workmanship on your furniture. Many furniture pieces are of sentimental value, as well as financially valuable: now you can give it a new lease of life and a whole new look. Reupholstering your favourite pieces is easy and convenient too, as all your furniture is picked up and then delivered back to you - looking better than ever! Read more about the upholstery process. 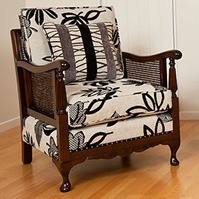 JBU furniture upholstery in Auckland provides both traditional and modern upholstery services. From time to time we sell high quality pieces of pre-loved furniture that can be upholstered in the fabric of your choice. James Backhouse's craftsmanship means that your cherished pieces will look better than new.